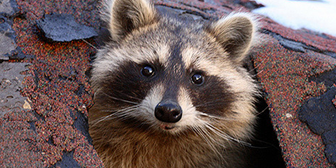 Legacy Rodent Control provides racoon removal in the Dallas-Fort Worth area. If these critters have invaded your home of business, our team of professionals will remove them humanely and prevent them from returning. 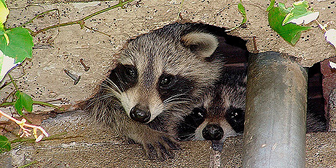 Raccoons are animals capable of causing extensive and expensive property damage. Not only do they urinate and defecate in your attic insulation, they have long, sharp claws with the ability to tear through your ductwork. When your ductwork is damaged, the bacteria found in raccoon feces can travel to the rest of your home, exposing your family to illness. Although they are wild animals, raccoons have adapted and thrive in the suburbs. They forage for food in neighborhoods and shopping centers, and often look to these homes and businesses for shelter. Raccoons are active at night, and as a result, you will hear them moving and scratching in late hours. Because raccoons are on the larger side of the unwanted pest spectrum, it may sound like a person is walking in your attic or along your ducts. If you suspect a raccoon infestation in your attic, call Legacy Rodent Control immediately. We are trained to handle raccoon removal in Dallas and Fort Worth, and equipped to assess and handle the damage they leave behind. Their waste is toxic and has been reported to cause serious illness, including lung damage. The damage caused by raccoon waste is so significant that it in some cases it may stain your ceilings and walls. As professional raccoon removal service providers in the Dallas and Fort Worth area, we have years of experience. Legacy Rodent Control will inspect your home or business to identify entry points and provide you with a plan to remove them from your DFW property using humane methods. We ensure they can never return by using metal barriers and sealants. These barriers and sealants are weatherproof, durable, and will withstand the raccoon’s best efforts to re-enter your home. Once the raccoon is removed, we will assess the damage caused by the raccoon, providing details on how we will handle affected areas. In many cases, raccoon damage is so significant, that insulation must be completely removed in order to ensure no illness causing bacteria is left behind. After insulation is removed, our raccoon control team will fog your attic with a treatment designed to kill bacteria and spores, as well as mitigate odors. After your attic is thoroughly decontaminated, we will replace your insulation with high quality, energy efficient fiberglass insulation. For help with raccoon control in Dallas and Fort Worth, Texas, please call Legacy Rodent Control today at (469) 435-9810. We provide raccoon removal services you can trust.